In women, testosterone promotes bone growth and density, heightens sexual sensitivity, and more. The quantity of testosterone produced in a woman's body will vary upon age and the reproductive stage in which she finds herself. Understanding testosterone's proper functioning is crucial due to the number of glands, receptors, and body systems involved with its production. Read on to discover more. Even though androgens such as testosterone are typically associated with men, they also play important roles in women's physiology. Testosterone contributes to healthy libido as well as maintains bone and muscle mass throughout life. It also plays a crucial part in estrogen production among other functions. Fifty percent of testosterone is produced by converting weaker androgen precursors into testosterone in extragonadal conversion sites, like the skin and fat tissues. The other 50 percent of testosterone production happens by converting cholesterol to testosterone within the adrenal glands and the ovaries. When ovarian function stops after the menopausal transition, levels of androgen hormones - such as testosterone - do drop. 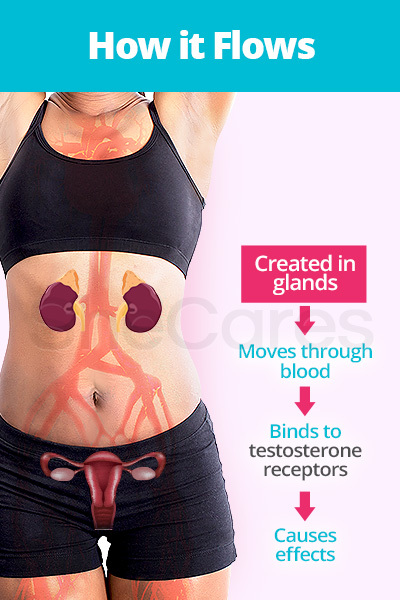 However, the adrenal glands and ovaries continue producing testosterone. Also, by the action of enzymes in peripheral tissues, testosterone can be converted to estrogens in postmenopausal women. 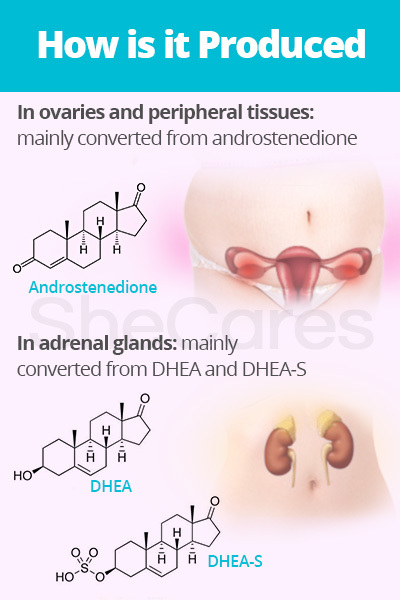 In women, main androgen precursors of testosterone are dehydroepiandrosterone sulfate (DHEA-S), dehydroepiandrosterone (DHEA), and androstenedione. 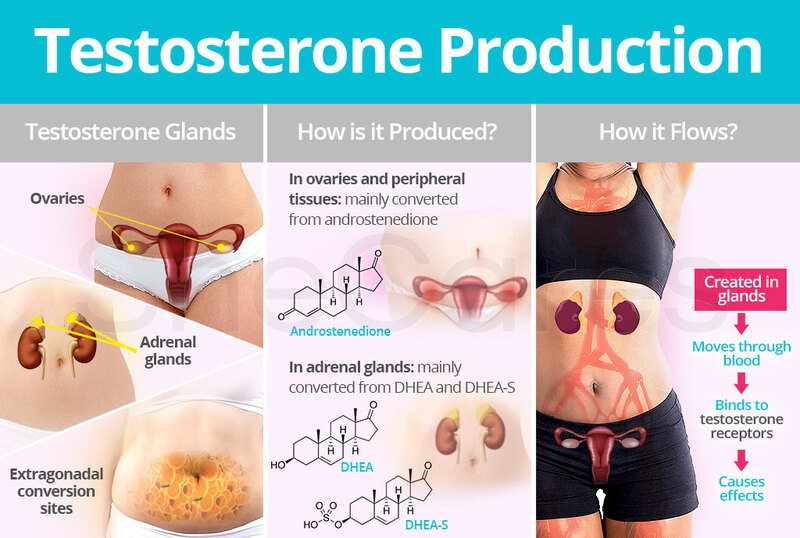 In the ovaries and peripheral tissues, such as fat tissues and skin, potent testosterone is mainly produced from androstenedione, a weak androgen precursor, with the help of enzymes. 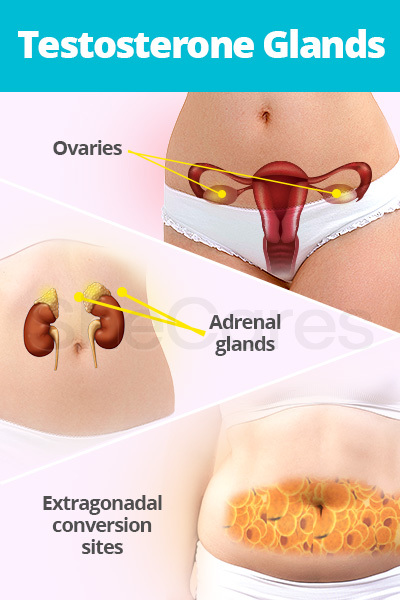 In adrenal glands, testosterone is mainly converted from DHEA and DHEA-S, which are also weaker androgen precursors, by enzymes. The adrenal cortex also secretes the androgen androstenedione into the bloodstream to be converted into testosterone. The hormone is synthesized in and secreted by a variety of glands for use locally and remotely within other areas of the body. Nevertheless, testosterone is largely produced by the ovaries and adrenal glands. Ovarian theca cells are principle testosterone glands that produce androgens in response to luteinizing hormone (LH). These androgens are then converted to testosterone and estrogen. After natural menopause, ovarian testosterone production continues to a variable extent. The adrenal cortex, the outer part of the adrenal glands, releases androstenedione into the bloodstream, where it - along with other weaker steroid hormones - is converted into testosterone and estrogen. Testosterone production from adrenal glands declines with age, but it will continue into postmenopause. Furthermore, active androgens such as testosterone can be created from circulating precursors in peripheral tissues, like skin and fat tissues, where they both act and are metabolized. The hormone travels throughout the body in the bloodstream to target and bind to specific hormone receptor sites on cells after it is secreted from testosterone glands. Accordingly, because the hormone flows in the bloodstream and binds to specific receptors throughout the body, abnormal levels of testosterone will affect various organs, such as the brain, uterus, ovaries, gastrointestinal tract, and others. Once testosterone discovers a receptor site, it infiltrates and passes through the cell. Its entry will then create an assortment of cell reactions according to the amount of the hormone received. Furthermore, various reproductive hormones produced by the gonads, including testosterone, are part of feedback loops that control their release and regulate their numerous effects on the body. Testosterone is mainly metabolized in the liver, where it is converted to inactive compounds. It is later expelled in the urine or feces. If this process is not working properly, it can cause reabsorption, which can also bring about symptoms of hormonal imbalance. Continue reading to discover more need-to-know information about testosterone roles and effects throughout a woman's body. Becker, K.L. et al. (2001). Principles and Practice of Endocrinology and Metabolism. Pennsylvania: Lippincott Williams & Wilkins. Available from Google Books. Boron, W.F. & Boulpaep, E.L. (2017). Medical Physiology: Third Edition. Pennsylvania: Elsevier. Available from Google Books.